Don’t worry, I already gave Sean a hard time over those palm trees in the background. He assured me it wasn’t all that warm in Texas last week. 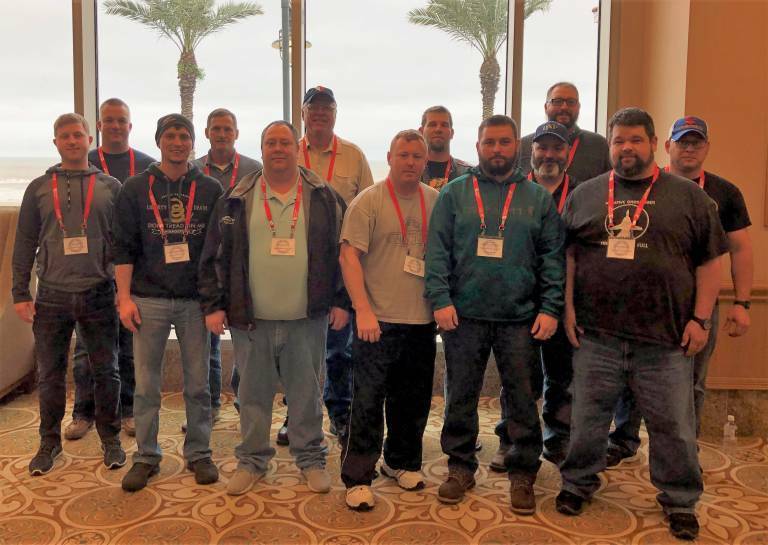 Pictured from left: Zach C., Clint C., Darryl W., Tony P., Sean S., Tom H., Billy S., Josh T., Anthony V., Brian P., David M., Justin D., and Brad T.
These members of our Maintenance Team just got back from a week at AIMS training and certification. AIMS stands for Amusement Industry Manufacturers and Suppliers, International. According to their website: AIMS International is a non-profit 501(c)(6) association dedicated to improving amusement Industry safety through leadership in education. AIMS International provides training classes and certification (CEU) programs for ride inspectors, operations, aquatics, and maintenance personnel through its annual Safety Seminar. Safety training isn’t a once-a-year occurrence around here, it’s every day. Whether it’s an all-day training course or a reminder to dress warmly in this 10-degree weather, our crews are held to the highest standards. Why? Because we want them to go home to their families each day in stellar condition. And we want the same for our park Guests each day of the operating season.